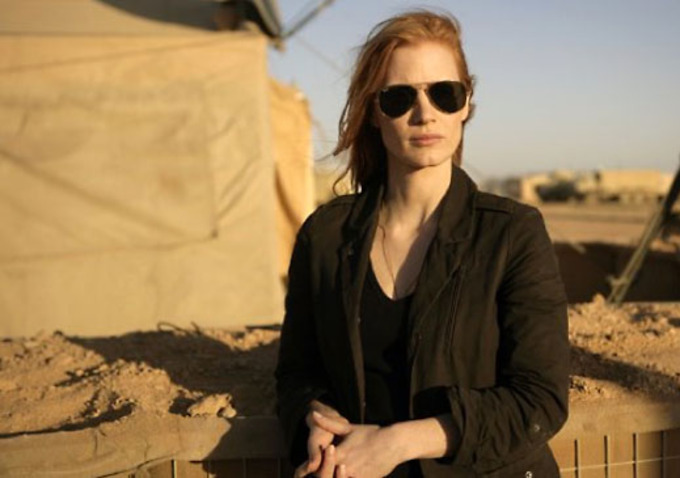 Zero Dark Thirty begins with a moment that is shocking in its simplicity. Over a black screen, we hear the actual voices of those caught up in the horror of the September 11th attacks, beginning with the relatively calm words of people on the ground trying to figure out what was happening, gradually building to phone and black box recordings of the victims themselves. The voices overlap each other, growing more deafening until they form a wall of fear, death and incomprehension. It's a remarkably effective way of recreating the events of that day without feeling exploitative or crass, instead placing the audience at the whirling centre of the maelstrom. The film then jumps forward to 2003, as Maya (Jessica Chastain), a CIA operative working as part of the team hunting for Osama bin Laden, arrives at a "black site", where she witnesses another operative (Jason Clarke) violently beat and torture a prisoner. It's an appropriately horrific initiation into a clandestine world of violence and subterfuge that consumes the next eight years of her life, as she slowly, obsessively and inexorably moves closer and closer towards her goal of finding and killing bin Laden. Probably the first thing that needs to be said about Zero Dark Thirty - other than that it is excellent - is that it is a film which is neither pro- or anti-torture. To suggest either would be to do a great disservice to the film by grossly misrepresenting it, and to obscure the key point about its depiction of American torture: the mere fact that it depicts American torture, and unambiguously, at all. There are no attempts to hide behind euphemisms or to soften the blows: It is pretty graphic in its depiction of so-called "enhanced interrogation" techniques, and it would take a truly heroic act of bold-faced lying for anyone to claim that the acts carried out do not qualify as torture. It also stops short of condemning it, or showing anyone questioning its efficacy as a method of gathering information. There certainly aren't any characters who out and out endorse torture, either, but there are plenty who view it as a grim necessity in a fight against evil. This is not the view that the film itself seems to take - crucially, torture plays no part in finding bin Laden: it was actual information gathering like bribery, observation and detective work that eventually led to his death in May of last year - but it also does not avoid the uncomfortable truth that there were people who carried out horrendous acts because they were told to do so, and that some of them believed they were doing the right thing. It's an ambiguous take on a subject which is pretty much unequivocally awful, and as such could be considered cowardly on the part of director Kathryn Bigelow and writer Mark Boal. But more cowardly than not showing the torture? Absolutely not. Bigelow and Boal's approach is more journalistic than it is editorial: they are interested in depicting the events with as much verisimilitude as possible and letting the audience decide what to make of them. To that end, Zero Dark Thirty is a meticulous film about the long, slow process of trying to find a man who helped to orchestrate an unthinkable tragedy, then seemed to disappear from the face of the Earth. Bigelow's stripped-down, dusty visual style perfectly complements this approach by drawing out the small details of the story; the cramped, dirty rooms in which the investigation is carried out, the crowded, quietly hostile streets of Pakistan, the ordinary details of everyday life which are shockingly destroyed by an attack. You can feel the heat and the desperation oozing out of the screen. The closest analogues for the film are probably David Fincher's Zodiac or Alan Pakula's All The President's Men; necessarily episodic stories about obsessives who doggedly sought out the truth (though Maya's search is ultimately somewhat more successful than Robert Graysmith's). There's a real sense of what a grinding, fruitless task it must be to sift through countless leads, find one that seems to hold some promise only to see it wither on the vine as no one realises its potential importance. It's that focus on the minutiae of the job that makes the film such an engrossing experience. It's also in no small part due to Jessica Chastain's superb performance as Maya, both because she's in almost every scene of the film, and because the film covers such a broad stretch of time that the lead needs to convey Maya's fierce dedication in the face of colleagues who doubt her instincts, and the enemies who threaten her life. Chastain delivers in spades, creating a character who is believably weary by the end of the film, whilst never losing sight of the intense fervour that drives her. Also, as a woman in a world - and a film - dominated by men (played by the likes of Kyle Chandler, James Gandolfini and Mark Strong), she has to be the strongest, toughest person in every room. The dialogue avoids the pitfall of sounding like traditional action fare, aiming instead for realism above all else, but there is still the odd line here or there which could have been unintentionally hilarious if delivered by anyone who wasn't completely convincing. Chastain convinces fully (and also nails the lines that are intentionally funny lines as well). Though the discussion of Zero Dark Thirty will continue to focus on one relatively small aspect of its story, hopefully it will not overshadow what an exhilarating, tense and enthralling film it is. Kathryn Bigelow is probably the best action director working today, and she once again demonstrates her mastery at creating indelibly tense sequences - from a standoff in a Pakistani back street to the prolonged, unbearably quiet raid on bin Laden's compound - whilst embedding them naturally in a character study that is as compelling as the investigation the characters are involved with. More importantly, it is a mainstream, accessible film that tries to engage honestly with America's recent history, particularly the terrible things that were done out of anger, fear and a lust for vengeance in the wake of a previously unimaginable tragedy. It exposes, rather than condones or condemns, such actions by dragging them out of the darkness and into the light of the multiplex so that they might be better understood. It's a difficult, vital film whose attempts to get to grips with the past should be part of a broader cultural conversation, one that should include torture but, like the film itself is not merely about torture.